This Fairytale Princess is going to the ball tonight and needs you to dress her up using clothes from the Royal wardrobe. Spring is approaching, and the royal princess now has the chance to go out of the castle and enjoy the beauty of the spring scenery! Cinderella has been invited to take part in a huge dance party by her prince charming. Help her dress up in beautiful clothes quickly, otherwise she will be late. This beautiful princess is preparing for a big fight. She is the only one who can save her planet from the robots. Choose a comfortable outfit and a weapon for her and help her win the battle. 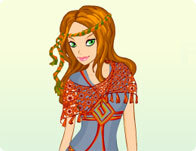 Princess Athena is beautiful seasoned warrior - dress her up with matching battle clothes! The Mermaid Princess has to be dressed for the royal swim through the ocean! Can you help her look good for all the fish to see?